Girugamesh is the Hot Topic at HT! 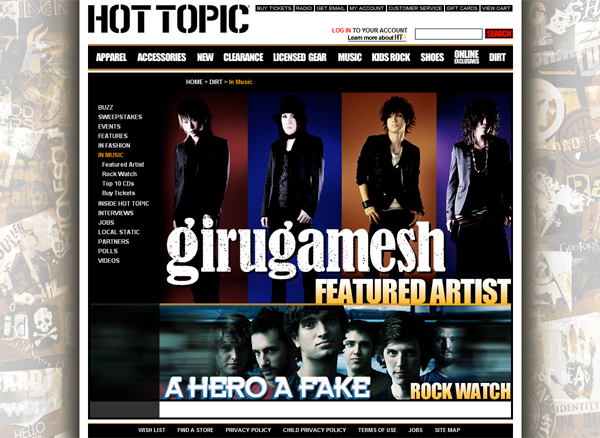 Japanese rock band Girugamesh was Artist of the week over at American store Hot Topic. The four member group has gained a lot of attention after releasing a couple of U.S. albums and now stands as a hot topic. 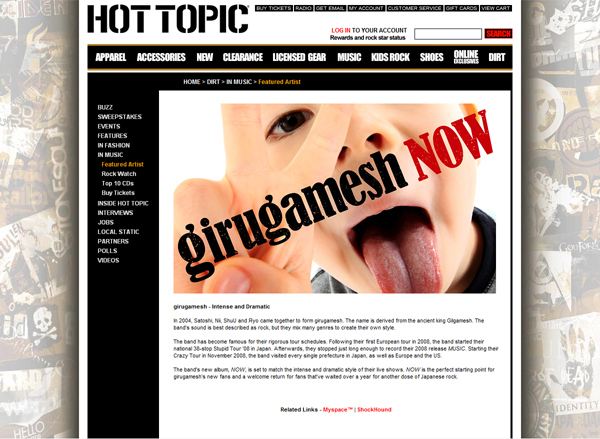 Girugamesh’s new album “NOW” hits the shelves this week at Hot Topic stores nationwide. The USA release contains the complete 28-page Japanese booklet with lyrics, photos, and liner notes from the band. In support of the USA release of the band’s new CD, JapanFiles and Hot Topic are giving away free replicas of girugamesh’s 2010 tour poster with the purchase of “NOW.” The 11″ x 15″ full-color poster lists all of girugamesh’s Japan tour dates in support of “NOW,” plus a photo of the band and jacket covers from all 3 editions of the new album. Poster offer available while supplies last. Posters not available in all stores. See your local Hot Topic store for poster availability. Also available online at HotTopic.com. Download girugamesh’s discography at the JapanFiles Digital Music Store. We at STC want to say congratulations to ya.. even if the week is over… and we are late in posting this. Hey at least we acknowledged it.